On this Christmas Eve I find myself on the Space Coast of Florida sleeping on the fold out couch in my parent's RV. The folks are sans grandkids this year as they hosted Christmas last year and theother sets of Grandparents get to do the honors. My Dad is already sick of Northern Michigan's winter so they headed south to celebrate the season. I drove down from Connecticut on Tuesday afternoon with a brief overnight stay in Bristol, TN and tonight find myself helping my mother finish with the prep work for tomorrow's dinner. We will be joining my mother's sister and her family in West Palm Beach for Christmas Day. It will be the first time in fifteen years we have been with my aunt at Christmastime. We will be small gathering but festive. Later tonight my Mom and I will go to Midnight Mass where we will celebrate the birth of Christ with our other family. When we retum to the RV, we will exchange gifts, drink eggnog with rum and nutmeg, and sing Christmas carols (Let that be warning to the nice people fron Pittsburg who own the RV pad next to my folks!) before we crash in bed. So, tonight on this most holy of nights no matter where you are, may you find comfort and joy and be surrounded by those you love. A few weeks ago, the fine folks at C&H/Domino Sugar asked if I would be interested in participating in a holiday baking promotion in exchange for a $20 gift card to offset some of the costs and blog about my Christmas goodies baked with their sugar. I accepted not only becauseI use their confectioners sugar. dark brown sugar, and super fine sugar when I bake but also because I find the quality to be superior to the store brands. 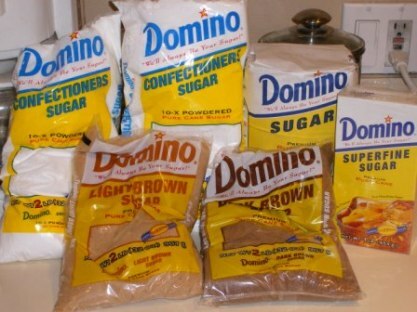 However I admit, I buy store brand light brown sugar and granulated sugar as often as I buy Domino and figured this would be a good time to put the store bought light brown and granulated sugar head to head with the Domino. I started my baking a few weeks ago before my month long business trips to LA, Las Vegas, Houston, and Charlotte and with yesterday's blizzard here in Connecticut, I hunkered down and baked late into last night finishing up today. Gluten Free Peanut Butter Cup Bars, Cranberry Orange Bread, and a loaf of my Grandmother's Rum Soaked Fruitcake. All the goodies mentioned above with the exception of the covered pretzels were made with sugar from Domino and I have to say I did find that the granulated sugar from Domino's was better than the store brand I usually use. I didn't have to break up clumps of sugar with a fork before adding it to my sweets like I normally do. The Domino sugar also caramelized more evenly than the store brand when I made the base for the toffee bars. 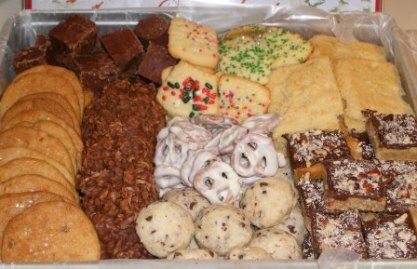 Thanks Domino for asking me to participate and you know, it isn't too late for you to put together an incredible tray of goodies for friends and neighbors. You can visit the C&H/Domino website here and get some fantastic ideas for Holiday gifts and goodies. Also, don't forget that Menu for Hope VI is in full swing! 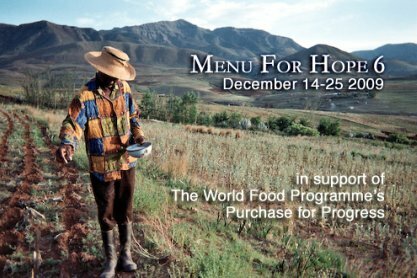 This year we are supporting the World Food Program's Purchase for Progress. I'm offering two bid items this year: a choice of a small box of LA Burdick's mice or penguins (UE08) or a Day of Breadmaking with me (UE09). You can go to the Menu for Hope VI bidding page at Firstgiving to show your support for this worthy cause. Preheat oven to 375 degrees. Beat butter until fluffy (about 2 - 3 minutes in a stand mixer). Stir in sugar, salt, and vanilla until combined. 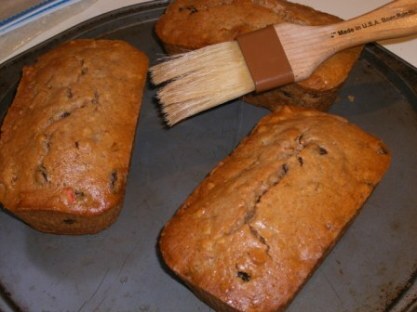 Gradually add in flour, nuts and chocolate chips. Shape dough into 1 1/2 tsp balls and place on ungreased baking sheets. Bake for 10 - 12 minutes until cookies just start to turn golden brown. Cool on racks. 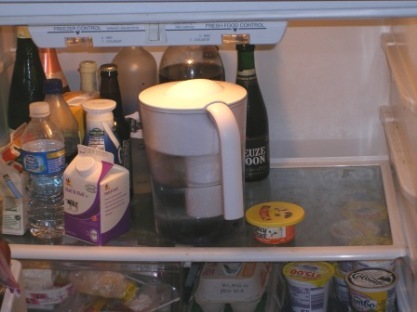 Store for up to one week in sealed container or freeze. It is that time of the year again when food bloggers from the world over unite to participate in Chez Pim's Menu for Hope raffle to support the World Food Programme. This year the proceeds from your bids will go to support the Purchase for Progress program. The Purchase for Progress program connects small local farmers with the World Food Programme by using the farmers to provide the foodstuffs the WFP uses in the regions they support. Not only does this mean that the small farmers benefit by getting a fair market value for their crops but the WFP benefits by having reliable supplies that are easy to distribute. This will be the sixth year I've participated in the Menu for Hope and once again I'm offering two wonderful items for bid in the Menu for Hope: LA Burdick Chocolate Mice or Penguins (winner chooses) and a Day of Bread Making with Breadchick. and the absolutely too cute for words penguins. These are the signature chocolates of one of the best chocolatiers in the United States, Larry Burdick. The mice are in three flavors: dark with orange interior, milk with mocha interior, and white with cinnamon interior. 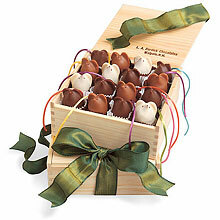 Each mouse comes decorated with an adorable face and pretty silk ribbon tail. Each penguin is a ganache of dark chocolate and lemon, with almond arms, dressed in a dark chocolate and white chocolate tuxedo. Sorry, due to the nature of the product, shipping for this bid item will be only to bidders in the USA. This is the third year I've offered this prize and I have to say I'm not sure who had more fun the past two years, the winner of the bid or myself. This is an "in your home" day long lesson on making bread completely by hand for the winner and up to three of their friends or family. I will come to the winner's house on a weekend day and teach them to make bread the old fashioned way, completely by hand (no mixer, no bread machine). The winner will learn all about how to have success with bread and yeast in their home and learn techniques like proofing yeast, kneading, and how do you know you will have bread and not a "hockey puck". 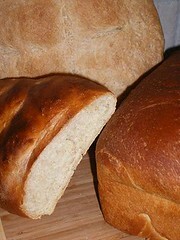 We will make two loaves: basic white or whole wheat and one specialty bread like cinnamon rolls, Challah, or whole grain. Along the way, I'll answer any questions about bread, different techniques for making bread and we'll have a "show and tell" about ingredients. The winner will also get a home bread making kit that includes my preferred loaf pan, yeast, King Arthur flour and recipes for the breads we make with step by step instructions. This is the perfect prize for the person who is terrified of yeast and making bread by hand but always wanted to try. Unfortunately, unless the winner is willing to pay my travel costs, this bid item is only offered to folks living in Massachusetts, Connecticut, Rhode Island, New Jersey, Eastern Pennsylvania and the greater NYC area. This year, my fabulously talented friend Helene of Tartlette fame is the hostess for the Eastern US Menu for Hope. If you want to see some other wonderful bid offerings from my fellow east coast food bloggers, visit her Menu for Hope listings. Or you can visit Chez Pim's page for a full listing of all the items for bid world wide. 1. Choose a bid item (UE08 for the Burdick Chocolates or UE09 for the Day of Bread Making with Breadchick) or bid items of your choice from our Menu for Hope main bid item list. 2. Go to the donation site at Firstgiving and make a donation. Each chance for the bid item is $10 again this year. Each $10 you donate will give you one raffle ticket toward a bid item of your choice. For example, a donation of $50 can be 2 tickets for UE08 and 3 tickets for UE09 - 2xUE08, 3xUE09. 5. Please, please, PLEASE check the box to allow us to see your email address so that we can contact you in case you win. Your email address will not be shared with anyone. Check back on Chez Pim on Monday, January 18 for the results of Menu for Hope bids. Now go get clicking over at First Giving and bid! I'm hosting Weekend Cat Blogging this weekend again because Mom isn't here to help. Mom is stuck at the airport in Atlanta because stupid Delta Airlines made her miss her connection because they didn't have the gate for her airplane ready and they made her sit on the tarmac of the airport for over 50 minutes while there were other empty gates. She was madder than a wet cat I tell you. 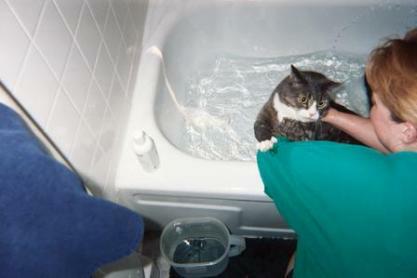 And I know something about being a wet cat! Since Mom hasn't been home to take any new pictures of me and it is getting really close to Christmas, I decided to post two of my favorite pictures of me at Christmas time. 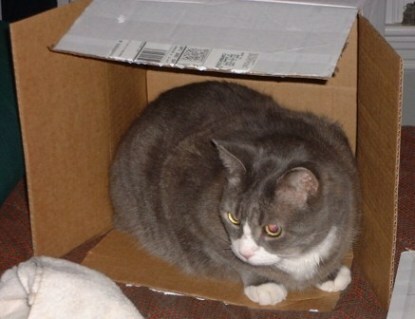 The first one was of me in a box that some Christmas presents came in one year. Mom put the box on Dad and her's bed and I decided to hop right into it. It was a good spot to hide and pounce on clean laundry. The other was taken the first year I came to live with Mom. 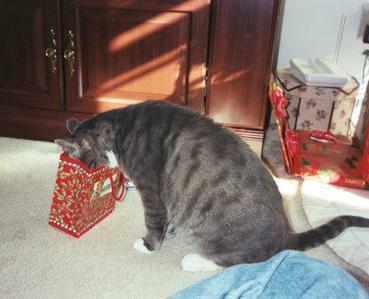 She got me a cat nip mouse for Christmas and I had to snoop before Christmas and got my head stuck in the bag hiding the cat nip mouse. I knew I never wanted to be a Tom Cat again when she let me keep the mouse. If you want to show us what you are doing to get ready for the Holiday season or just want to join us for Weekend Cat Blogging, leave a link in our comments! Check back on Sunday evening to see all the fun pictures of kitties. Tomorrow will be the big Holiday baking day here at the Sour Dough and considering the rest of my month's travel schedule, I better make the most of it too! I'd say I have a long day ahead of me. I'm still on west coast time, so prepping for the day of baking isn't too bad and I've got the PGA Q-School on the Golf Channel (volume turned down) and the Time Life Treasury of Christmas Collection to keep my company. 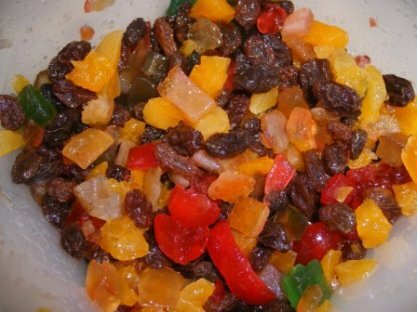 I've already got the candied and dried fruit for my special fruit cake all chopped up and macerating in rum. and now two rolls of refrigerator cookie dough are resting comfortably under a half hotel pan with a large sourdough ciabatta has joined the cookies for a long winter's overnight rest. I was in Vegas for the last half of the week. It came on the heels of my Santa Monica/LA trip of the first half of the week. I ate at two of my favorite restaurants in both places, Cafe Del Rey in Santa Monica and Craftsteak in the MGM Grand in Vegas. I've been eating at Cafe Del Rey for almost thirteen years and blogged about my meals there before. Craftsteak is a newer "must go to when in town" restaurant for me but I never fail to have a fantastic albeit expensive steak there and they make the best Sidecar I've ever had outside of the Algonquin. But, what saved me in Vegas wasn't the Sidecar and the steak but rather my Brisk Brew. You see, Vegas hotel rooms don't have coffee makers in them because they want you to have to go down to the hotel deli/coffee shop at 5am and drop some coins in a slot machines on the way to get your caffeine fix. 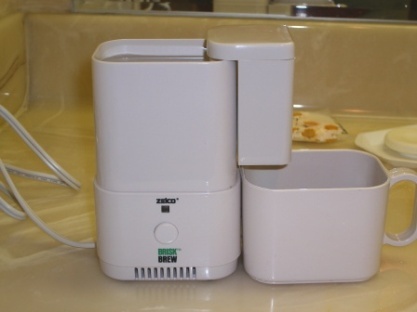 I love my Brisk Brew for making coffee, tea, and even instant soup. I can't tell you the number of times even delayed in an airport after all the shops have closed that this little gadget has saved my life (and that of some fellow travelers). Unfortunately, Zelco has discontinued the product. The Voltage Valet looks to be a close replacement and is priced about the same as I paid for my Brisk Brew. 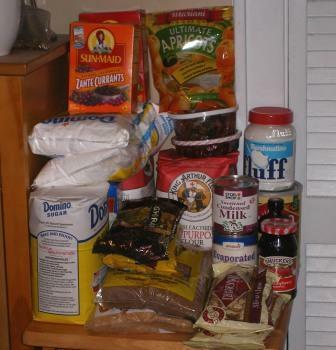 What is on my baking list for tomorrow besides fruitcake? and if I have time, white chocolate dipped pretzels. A good old fashioned Christmas goodie package if I say so myself.